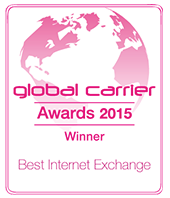 [Satnews] For the second time in its 20th anniversary year, DE-CIX has broken traffic records at its Frankfurt Internet exchange. 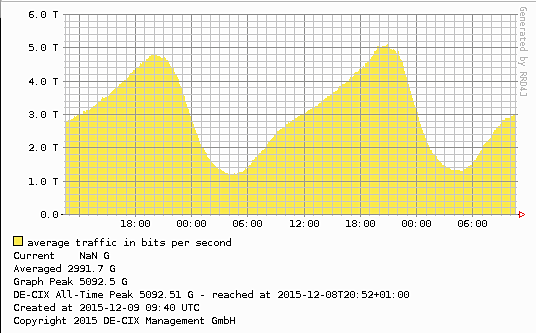 On December 8, 2015, DE-CIX measured the new active data traffic peak of 5 Terabit per second (Tbps). The milestone 4 Tbps-mark was first cracked in April of this year. DE-CIX management attributes this strong increase to the excellent development of its business. An additional cause is the unending rapid data growth worldwide, which is driven predominantly by video content and the fast-moving expansion of Internet-enabled mobile devices like smartphones and tablets. Despite this remarkable growth, DE-CIX is not bursting at its seams: the exchange’s infrastructure was completely modernized in 2013 and has a total capacity of 48 Terabit. A large driver for global data growth is primarily video content, which results from video streaming, HDTV via Internet, online gaming and user-generated content in social networks like YouTube or Facebook. In addition, the constantly growing number of mobile devices is clearly pushing worldwide data traffic higher, since these devices enable access to content from anyone, anywhere and at any time. As an example, in its current Visual Networking Index, Cisco predicts that mobile data traffic will grow 10-fold between 2014-2019, which will be three times as fast as the traffic on fixed line networks. While mobile data traffic in 2014 represented only four percent of total IP traffic, the Cisco report predicts that that figure will grow to 14 percent by 2019.